Colin Kaepernick and San Francisco 49ers safety Eric Reid kneeled during the national anthem Thursday night. SAN DIEGO (AP) — While a naval officer sang the first notes of “The Star-Spangled Banner” and dozens of military members unfurled an oversized flag on the football field, Colin Kaepernick and Eric Reid dropped to one knee on the San Francisco 49ers’ sideline. With his silent gestures of protest, Kaepernick intends to keep drawing attention to a litany of American problems — and he’s no longer alone. Kaepernick and Reid kneeled during the national anthem Thursday before the 49ers’ 31-21 preseason victory over San Diego, ignoring scattered boos and angry shouts in Qualcomm Stadium at the Chargers’ Salute to the Military preseason game. Kaepernick’s protest has dominated the public discussion of the nation’s most popular sport this week, and his stance has been met with passionate condemnation and support. 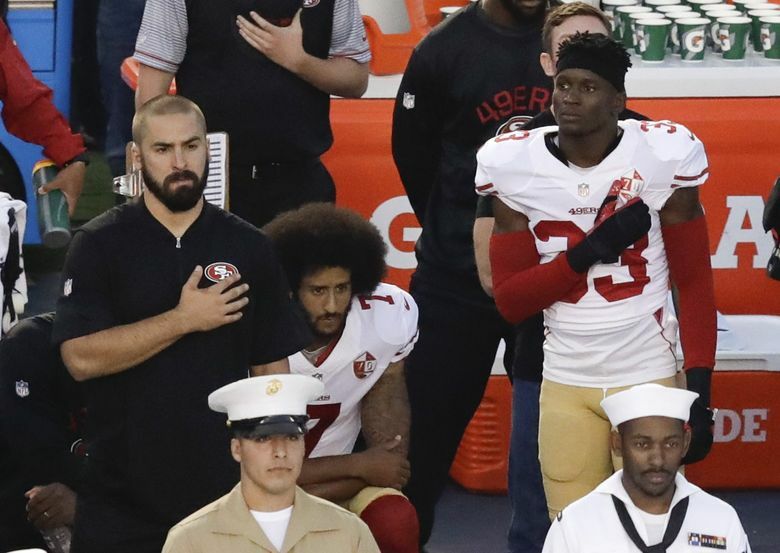 His refusal to stand for the anthem first came to public notice last week when he remained seated on the 49ers’ bench before a preseason game against Green Bay. Kaepernick said he plans to continue his protests during the regular season. He also intends to donate $1 million “to different organizations to help these communities and help these people,” declining to provide specifics. Kaepernick wasn’t earnestly booed in San Diego until he took the field to start the game for the 49ers, immediately leading them on a 16-play, 85-yard touchdown drive against the hometown team. Amid his burgeoning social activism, he is also fighting for a roster spot and attempting to regain the starting job that he lost last season. When Kaepernick left the field following pregame warmups, he was greeted with profanity and obscene gestures from Leo Uzcategui, a 20-year Navy veteran in a military-green Chargers jersey with quarterback Philip Rivers’ No. 17 in camouflage numbering. Kaepernick was thrilled to be joined by Reid, the 49ers’ starting safety and a fourth-year veteran from Baton Rouge, Louisiana. Reid and Kaepernick decided together on kneeling rather than sitting during the anthem. When the same naval officer performed “God Bless America” before the fourth quarter, Kaepernick remained standing and then applauded along with his teammates. Kaepernick doesn’t intend his stance to be a criticism of the military. When the Chargers’ public-address announcer asked fans to recognize active military personnel during a timeout, the quarterback stood and enthusiastically applauded along with his teammates and the entire stadium. Kaepernick’s social activism, which only emerged publicly in recent weeks, also included support for the Black Lives Matter movement through social media.